Dedicated to the memory of Giles R. Wright II (1935-2009), whose special dedication to preserving the history of Timbuctoo lives on! 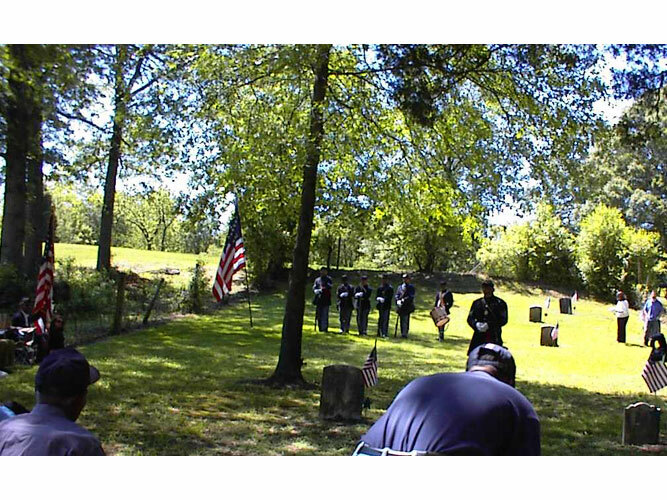 This is an expanded version of a Memorial Day eulogy that Gail Astle gave on May 25th, 2008 at Timbuctoo Cemetery in Westampton Township, New Jersey. Each African American Civil War soldier buried there was honored as she walked from tombstone to tombstone. In the following presentation, the same order of names has been retained. 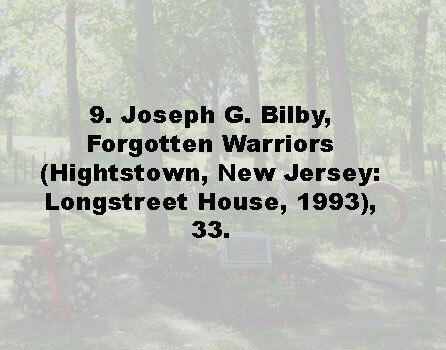 We come to honor all the soldiers buried in this hallowed site and to learn more about who they were. These men formed a tightly knit Band of Brothers; they knew each other before the war, supported and watched out for each other during the war, and visited with each other almost daily after the war. 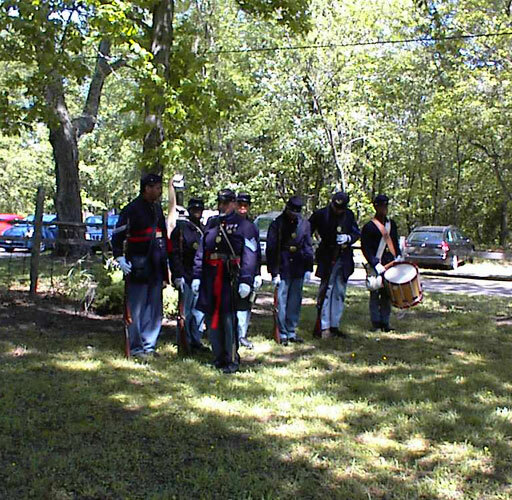 6th Regiment United States Colored Troops Reenactors. 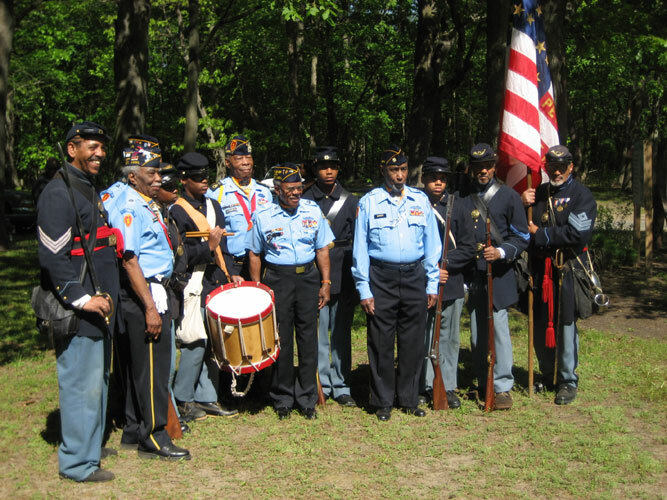 First Sergeant Fred Minus (holding the flag) with the 6th Regiment United States Colored Troops Reenactors and of veterans from the 24th Infantry Regiment nicknamed the Buffalo Soldiers. 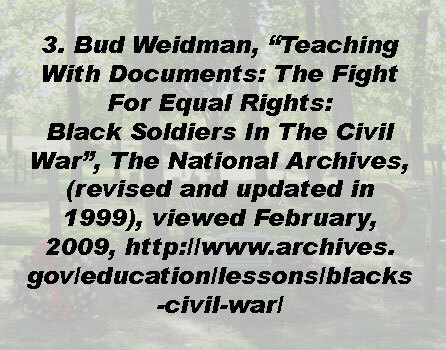 According to Fred Minus (historical interpreter/Civil War soldier reenactor First Sergeant/Sixth Regiment/United States Colored Infantry) there were 209,000 United States Colored Troops and 166 Regiments that served in the Civil War. 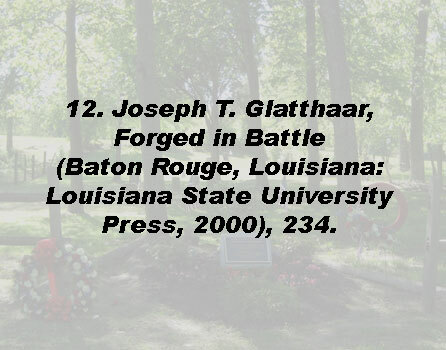 They fought in 449 battles of which 39 were responsible in changing the course of the Civil War. In the Antebellum era, people who lived in Timbuctoo were forging an independent progressive community. The predominantly black residents worked hard and used their money to buy land, build churches and construct a school. 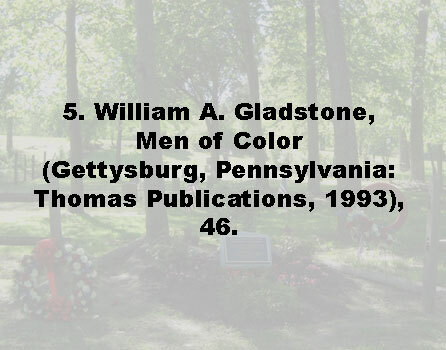 10 Some of the best men went off to fight in the Civil War, but found no easy jobs when they returned home. Most of the available jobs required hard physical labor and were too physically demanding for the disabled war veterans. As a result, they became economically destitute and dependent upon a pension system which, with its white doctors, lawyers, and investigators, granted some monetary compensation for their disabilities. It was almost like a pension welfare system. This was especially true after the Dependent Pension Act of 1890, which expanded eligibility to include disability regardless of the cause, provided that the Civil War veteran met all other requirements. However, securing a pension was often difficult because Pension Acts contained many rules that did not favor African American veterans or their widows. For example, obtaining the necessary paper trail for eligibility was sometimes impossible and claimants were often denied because they could not produce birth, marriage, or death certificates. 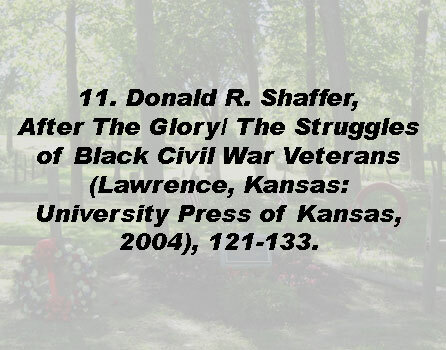 Author, Donald R. Shaffer, in “After The Glory/ The Struggles of Black Civil War Veterans”, analyzes and describes many such obstacles experienced during the application process by the black veteran with emphasis on their disadvantages due to poverty, illiteracy, and inability to prove identity. Another hindrance was the unpredictable reliance on human subjectivity, be it a claims agent, eyewitness, or the Pension Bureau itself. 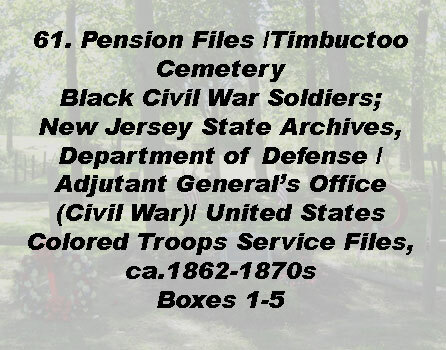 11 Consequently African Americans were scrutinized very carefully as was witnessed in the Timbuctoo Pension Files where special examiners were often employed to determine the fate of a granted pension allowance. It was often difficult “to make ends meet”. Even wives worked hard with washing and cleaning jobs that paid very little. Children also helped their families financially with indentured apprenticeships. The importance of education, which led to literacy and a subsequent understanding of important laws, was clear to residents of Timbuctoo long before the war. The new postbellum mantra of some army officers was for black soldiers to become leaders in the black community, save their money, buy land, and educate their children. 12 This was a formula Timbuctoo had already put into practice. Imagine how depressing these times must have been for this neighborhood and how psychologically destructive it was for these once strong men to have to rely on their weaknesses to support themselves! We honor the brave African-American men from this community who joined the Union Army in the fight against slavery during the Civil War. 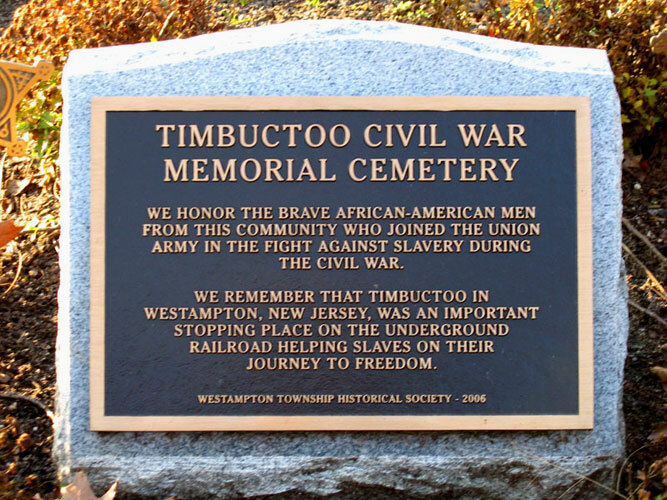 We remember that Timbuctoo in Westampton, New Jersey, was an important stopping place on the Underground Railroad helping slaves on their journey to freedom. 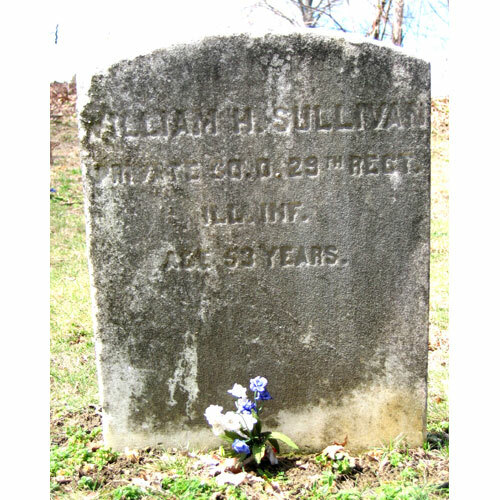 WILLIAM H. SULLIVAN; PRIVATE CO. D. 29TH REGT. ; ILL. INF. ; AGE 53 YEARS. The information for the foregoing profiles was retrieved from Timbuctoo Cemetery List read by Denise Davis and Sharon Fitzpatrick in 1980, (Burlington County Library), Federal Census lists (Burlington County Historical Society Library), State of New Jersey Bureau of Vital Statistics- Certificate and Record of Death (Trenton Archives), Return of Deaths and Return of Births in the Township of Westampton County Burlington (Burlington County Historical Society Library), early newspaper articles from The New Jersey Mirror and The Burlington County Herald, (Burlington County Library), communications with the following: local Timbucto historian, Mr. Alexander Franklin, Chiricahua National Monument historian, Kate Neilson, Director of the National Museum of Civil War Medicine, Terry Reimer, librarians Margaret Frame and Paula Manzella (Burlington County Library), librarian Terri Nelson (Princeton Library), education director Jeffrey Macechak (Burlington County Historical Society Library),historical interpretator/storyteller Fredric L. Minus, Civil War authors Joseph G. Bilby (Forgotten Warriors), James M. Paradis (Strike The Blow For Freedom), Bob MacAvoy and Charles Eckhardt (Our Brother Gone Before- 2 volumes), William A. Gladstone (Men Of Color), and from numerous Civil War books and service records that include Burlington County W.P.A. 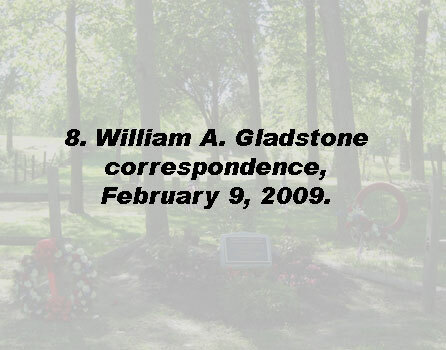 (Works Project Administration) Veterans Grave Registration Index Cards (Burlington County Library) and the Westampton Memorial American Legion Post 509 Grave Registration Computerized Records( courtesy of Samuel D. Hayes). The body and soul of these short biographies comes mainly from the Civil War Soldier Compiled Military Records and the Civil War Soldier and Widow Pension Files (U.S. National Archives & Records Administration, Washington, D.C.) with special thanks to researcher and author (Names on Record: a Journal Featuring Virginians of African Descent, 1998) C.V. Brooks. The material presented and interpreted from the mainly pension file documents should be viewed with caution as a reliable primary source. Such advocacy documents were very subjective in their accounts from veteran soldiers, neighbors, doctors, pension bureau agents, etc. 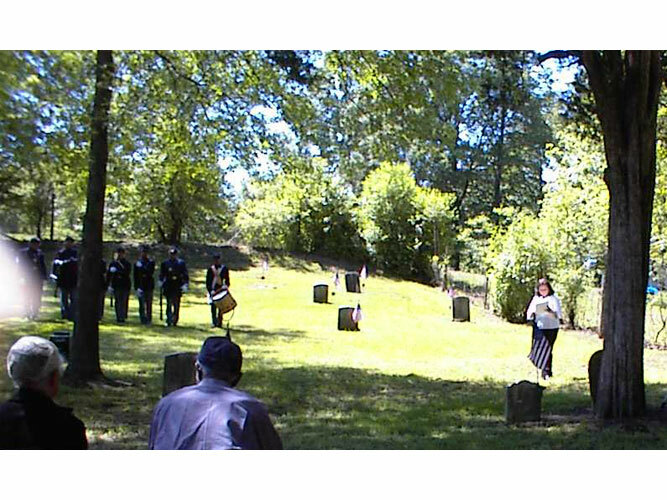 To the best of my ability I have attempted to tell accurate stories of brave heroes buried in the Timbuctoo Cemetery. 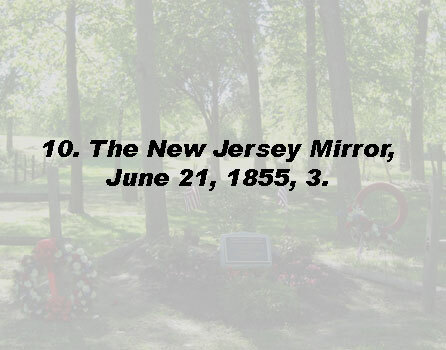 I wish to thank the many people who have helped me and especially Alexander Franklin and the members of the Westampton Township Historical Society who sponsored this event and developed this web page. 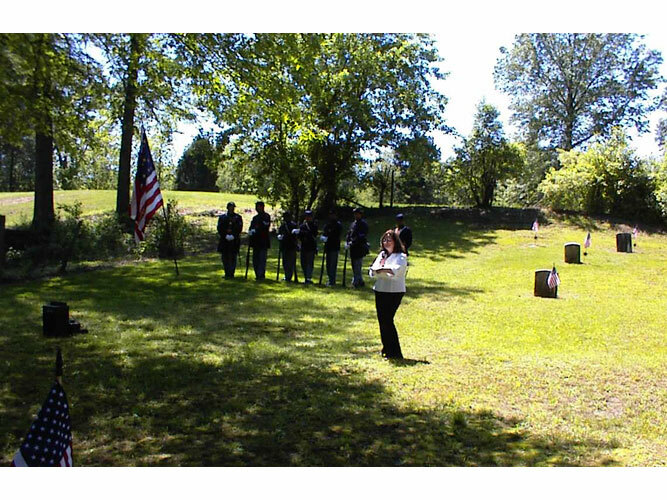 First I would like to welcome you all to the historic Timbuctoo Cemetery. We thank all Veterans for serving and fighting for our country. We thank you for your courage and sacrifice for the preservation of our freedom. 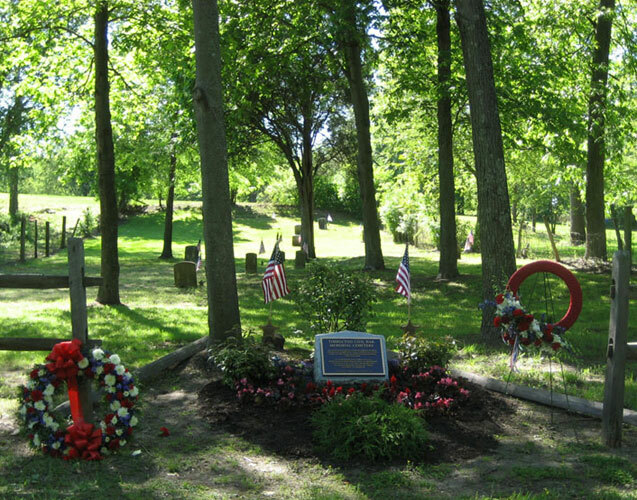 Today we are proud to honor the veteran soldiers buried here. These were African Americans who bravely fought in our Civil War and who helped establish the free society we enjoy today. 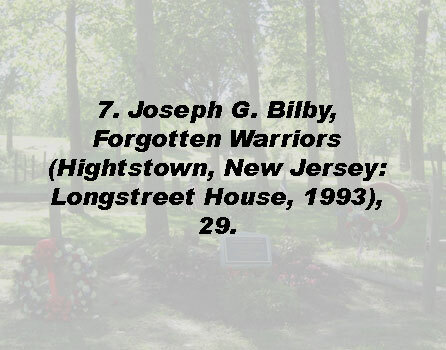 We also honor Giles Wright II of Willingboro, New Jersey, who sadly died on February of this year in Mount Holly after an eight month illness. We remember Giles as one of America’s most admired and productive historians. 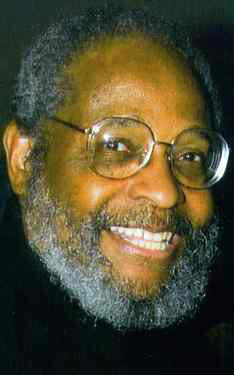 He headed the Afro-American History Program at the New Jersey Historical Commission for nearly 30 years. 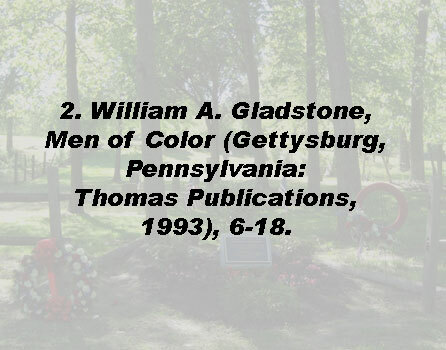 It was the first post established in the United States and Giles brought to this assignment, great distinction and scholarship in the documentation of black history. 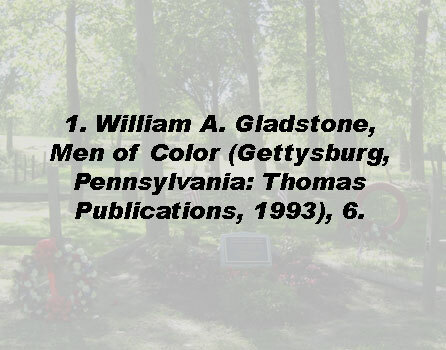 He used his expertise to illuminate the history of African Americans in New Jersey, particularly with the narratives of the Underground Railroad. 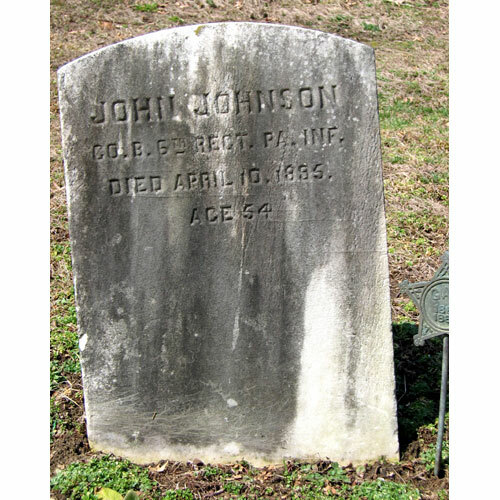 He was passionate in preserving the Timbuctoo Underground Railroad heritage and took great interest in this small Timbuctoo Cemetery that is the resting place of Civil War African American heroes. 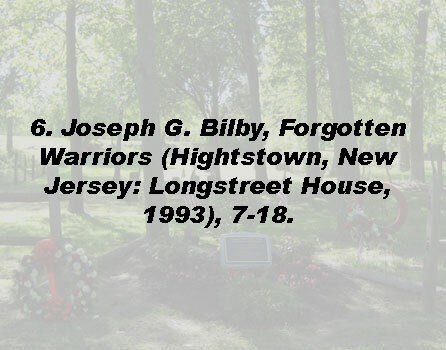 As a civic leader, with years of devotion to the public’s interest, he was instrumental in promoting public awareness and an appreciation for New Jersey’s black history through numerous writings, lectures, and presentations. 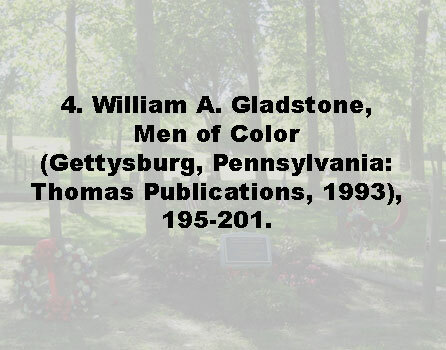 He is noted for several published works such as his book, The History of African Americans in New Jersey, his guide to the Underground Railroad in New Jersey, Steal Away, Steal Away, and for his assistance in the preparation of a New Jersey high school African-American Curriculum Guide. He earned a bachelor’s degree from Georgetown University, a master’s degree in African Studies from Howard University, and pursued doctoral studies in comparative labor history at Rutgers University where he also taught labor studies and Afro-American History.